Your BlackBerry is much more than just a phone — it can do all sorts of things that have nothing to do with talking or texting. By using Utilities apps, you can use your BlackBerry for even more, from editing pictures on your phone to keeping an eye on the parking meter. RepliGo Reader, from Cerience Corporation, is a nicely designed app that opens and reads PDF (Portable Document Format) files on (to be honest) the relatively tiny screen of a BlackBerry device. Just use the Mass Storage feature to move a copy of the PDF file you want to read on your BlackBerry. Then, open RepliGo to open the PDF file anywhere your BlackBerry and you travel. Store large files on the removable media card, not in the memory of the phone itself, which is more appropriately devoted to holding apps, contacts, and e-mails. 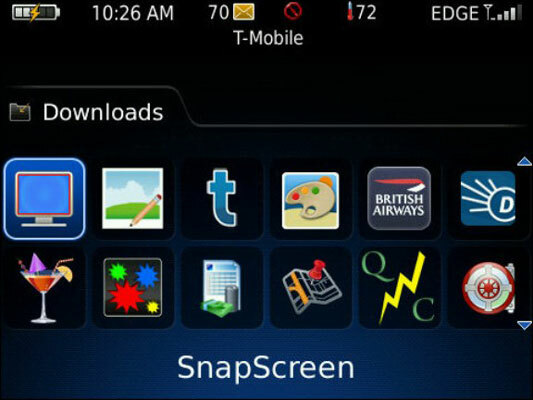 Here’s how Virtual Views Mobile Software’s SnapScreen works: when you see something you want to copy, press the menu key and then choose SnapScreen. A thin, colored border appears around the image on the screen. Press the menu key again and choose Send E-Mail, select a recipient, and send it. If you prefer, you can keep a copy on your BlackBerry by choosing the Save or Save As option from the menu. You might want to use the Save to Media Card option if you are roaming and don’t want to pay data charges. 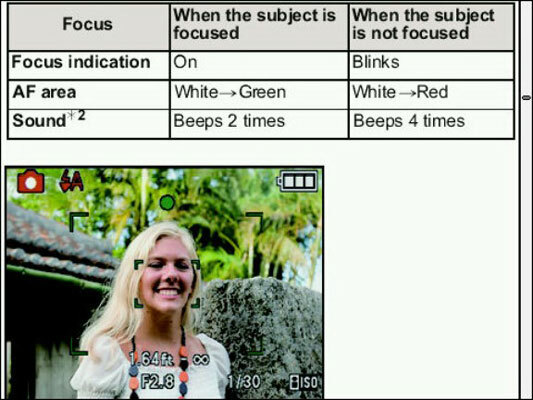 You can use CropIt, from All KAPPS Software, on any photos you have on your BlackBerry. Locate an image, then set an anchor point in one corner and another in the opposite corner . . . and then crop it. The simple app has just a few customization options that are easy to figure out. thinkOmatics’ MileageMeter is a simple but capable app that accepts basic information each time you add fuel to the tank of your car: the mileage on the odometer, the number of gallons added, the date, and the price per gallon. 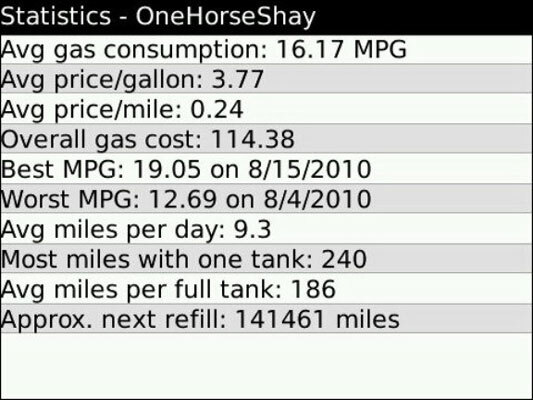 With that information, it produces a report that shows the miles per gallon (MPG), the average price per gallon and per mile, and other information (including a prediction of when the next refill will be necessary). If you’re a mathematician, a programmer, an engineer, or just think differently, then the Neelam app just might be the killer app for the BlackBerry. The calculator works with the BlackBerry trackpad or trackball, and also with a set of keyboard shortcuts. 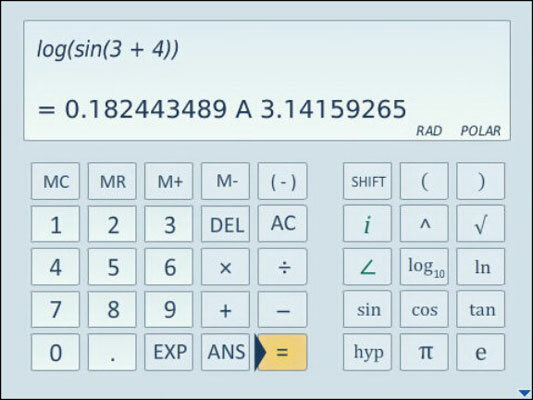 There are two screens of functions; just press the Shift key and you’ll go from advanced math to advanced scientific calculations. With Didacus Software’s Parking Meter on your BlackBerry, choose one of the preset time periods or enter a custom amount of time. Parking Meter sets off a really annoying, impossible-to-ignore, and absolutely appropriate siren when time is up. Shave off at least enough time to allow you to get back to your car before the meter maid or parking enforcement officer is due to pounce. Now this product is called Parking Meter, and it works quite properly for that very specific purpose. But there is no reason you could not also use it for any other situation where you need to carefully watch the clock: remaining time at an Internet café, baking a soufflé, or running on a treadmill to burn off the calories from the soufflé you ate at the Internet café. 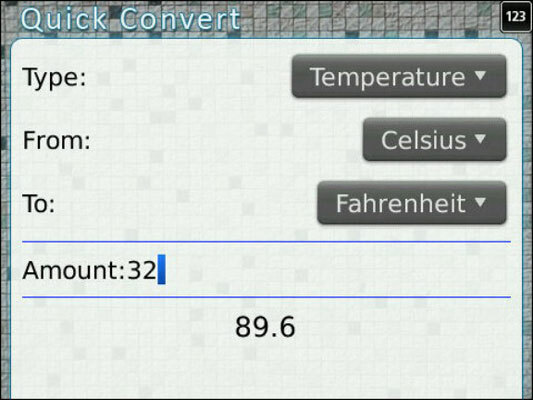 Quick Convert, from Mobilitea, is another small tool for special needs: You can convert temperature scales, speed, mass, length, area, and volume. Yes, if the drink recipe calls for two U.S. fluid ounces, a few clicks will tell you to use 147.8 milliliters and not a drop more. And you can speak about hectares with someone who thinks in acres or square feet. The Remote Print app (from Chocolate Chunk Apps) allows you to print or send any file from your BlackBerry (including e-mails, photos, documents, contacts, and just about anything else) by using its built-in Wi-Fi. The app consists of two modules. One installs on the BlackBerry and the other on your Windows-based PC.